Soy isoflavones have proven their efficiency in treating women’s issues, especially related to menopause and the symptoms associated with it. Menopause & Hot Flash Relief Drink Supplement Kuhl Care is a menopause supplement based on a specific blend of isoflavones called GeniVida®, but without soy, which may trigger some allergies in certain individuals. We were interested in understanding how this supplement works for alleviating the unpleasant symptoms of menopause, and looked a bit closer to this formula. What Does Kuhl Care Contain? This specific compound is soy-free genistein, the most important isoflavone found in soybeans. According to clinical studies, this very particular isoflavone plays a major role in alleviating all the unpleasant symptoms of menopause. While it is a great thing that a lot of medical research was invested in this formula, we would have liked to see more herbal extracts being included. 16 ounces of Menopause & Hot Flash Relief Drink Supplement Kuhl Care must be mixed with water and taken throughout a 24 hour period. When not used, the mix must be kept in the refrigerator, to avoid spoiling. A box containing 30 day supply costs 69.95USD, which is a bit steeper compared to most products on the market. The manufacturer offers 60 day money back guarantee, so you can try the product and see if it works for you. 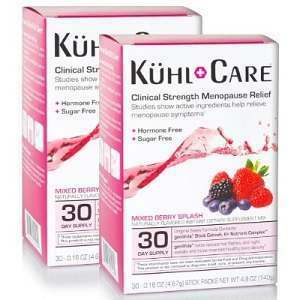 Menopause & Hot Flash Relief Drink Supplement Kuhl Care is based on a single, yet powerful, ingredient. While soy isoflavones play a major role in sustaining good health and hormonal balance, the content of soy can trigger certain allergies. This issue is addressed by the active compound in Menopause & Hot Flash Relief Drink Supplement Kuhl Care, genistein, which is soy-free isoflavone in its purest form. Jackie Horowitz	reviewed Kuhl Care	on October 23rd	 and gave it a rating of 2.5.